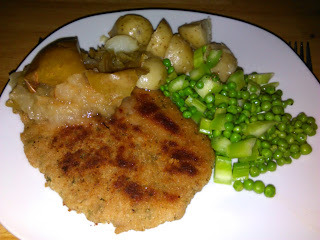 Breaded cutlets from Mitchell's, store made fresh, easy to cook, taste good. Paired with new potatoes boiled, salted and buttered. Peas and celery on the side. I cook the peas, drain, add butter and let the celery heat up with the melting butter. A little black pepper on the peas goes well. That leaves the apple. Fern made the apples from cored granny smith. He just roasted them in the oven till mushy. Mine needed a bit of salt. Apple sauce is definitely cheaper. A hearty meal at the end of the day.